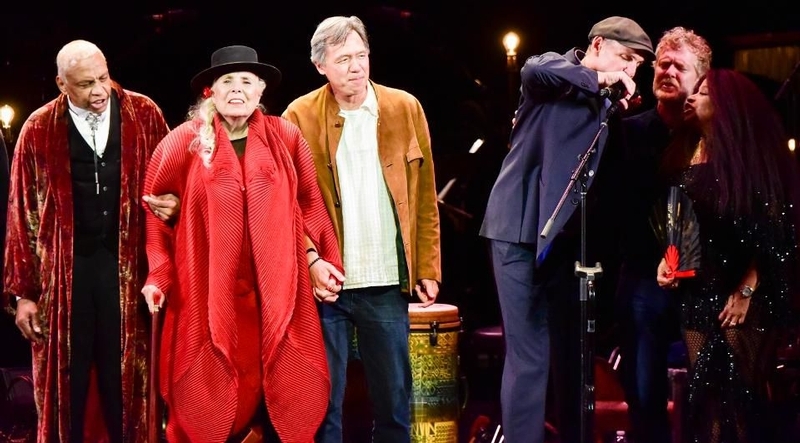 Joni Mitchell Steals The Show At Her Once In A Lifetime 75th Birthday Party In L.A. The combination of Joni Mitchell's catalog and a wide array of great artists, from Kris Kristofferson, Seal and Brandi Carlile to Graham Nash, Emmylou Harris and James Taylor, promised to be a special musical night. And indeed it was at JONI 75, a birthday celebration for the iconic singer/songwriter at L.A.'s Dorothy Chandler Pavilion. After the guest of honor was seated, Norah Jones began the night with an elegant rendition of 'Court And Spark,' the first of a night filled with standout performances. None more so than Seal's awe-inspiring 'Both Sides Now,' which moved several audience members around me to tears and drew a standing ovation that could've gone on for 30 minutes and it would not have done justice to the power and emotion of his rendition (look it up on YouTube now!). Equally moving for different reasons was Nash's loving and sweet 'Our House,' which he pointed out he wrote for Mitchell when he was 27 and she was 26. A photo of them together showed on the big screen behind him and the magnificent stage setup, which featured couches on both sides so the artists could stay on stage, led to Harris and Rufus Wainwright singing impromptu background vocals. Taylor also had a personal connection with Mitchell, which came across in his song choices of two of her biggest hits, 'River' and 'Woodstock,' which featured Seal, the star of the night on background vocals. Seal might have been the star, but Chaka Khan's 'Help Me,' and her birthday love for Mitchell and sweet message of how many times Mitchell saved her life; Wainwright's superb 'All I Want'; the pairing of Kristofferson and Carlile on the timeless 'A Case Of You' and Harris' back to back 'Cold Blue Steel And Sweet Fire' and 'Magdalene Laundries' all stood out as well in their own way. Interspersed throughout the night were audio clips of Mitchell talking over the years and a variety of photos and her paintings. But as meaningful and poignant as those were, it could not prepare the audience for the feeling of seeing the queen on stage in her throne. After the all-star finale of 'Big Yellow Taxi,' the curtain dropped to a standing ovation. The crowd kept standing and cheering though it seemed there was nothing left. However, after about two minutes, the curtain rose and Mitchell was seated on stage, flanked by two close friends. 'Big Yellow Taxi' was revisited while Mitchell sang along softly and grinned. Before the song began Nash walked over and courtly kissed her hand, expressing the bountiful love and admiration everyone in the room felt for one of music's most revered artists. What one could not have anticipated though was the stunning range of emotions on display during this incredibly powerful night. It started just after 7 PM when Mitchell entered the Pavilion to take her front row seat. Given her lofty status as one of the great living artists and her recent health problems, making public appearances increasingly rare, every Mitchell sighting is cause for celebration. And indeed, the celebrity-laden crowd, which included Tom Hanks and Rita Wilson, Cameron Crowe, Jon Hamm, Anjelica Huston and more, greeted the icon with a standing ovation, a mixed chorus of oohs and aahs and "Happy Birthday." After the guest of honor was seated, Norah Jones began the night with an elegant rendition of "Court And Spark," the first of a night filled with standout performances. None more so than Seal's awe-inspiring "Both Sides Now," which moved several audience members around me to tears and drew a standing ovation that could've gone on for 30 minutes and it would not have done justice to the power and emotion of his rendition (look it up on YouTube now!). Equally moving for different reasons was Nash's loving and sweet "Our House," which he pointed out he wrote for Mitchell when he was 27 and she was 26. A photo of them together showed on the big screen behind him and the magnificent stage setup, which featured couches on both sides so the artists could stay on stage, led to Harris and Rufus Wainwright singing impromptu background vocals. Taylor also had a personal connection with Mitchell, which came across in his song choices of two of her biggest hits, "River" and "Woodstock," which featured Seal, the star of the night on background vocals. Seal might have been the star, but Chaka Khan's "Help Me," and her birthday love for Mitchell and sweet message of how many times Mitchell saved her life; Wainwright's superb "All I Want"; the pairing of Kristofferson and Carlile on the timeless "A Case Of You" and Harris' back to back "Cold Blue Steel And Sweet Fire" and "Magdalene Laundries" all stood out as well in their own way. After the all-star finale of "Big Yellow Taxi," the curtain dropped to a standing ovation. The crowd kept standing and cheering though it seemed there was nothing left. However, after about two minutes, the curtain rose and Mitchell was seated on stage, flanked by two close friends. "Big Yellow Taxi" was revisited while Mitchell sang along softly and grinned. Before the song began Nash walked over and courtly kissed her hand, expressing the bountiful love and admiration everyone in the room felt for one of music's most revered artists. This article has been viewed 764 times since being added on November 9, 2018. Comments on Joni Mitchell Steals The Show At Her Once In A Lifetime 75th Birthday Party In L.A.